Among the older homes in Fort Wayne is the one at 407 West Berry Street where Noble Olds, a wagon maker and railroad car manufacturer, lived. The structure was built about 1870 and is one of Fort Wayne’s finest examples of Italianate architecture. Olds was born in 1818 in Bedford Springs, Pennsylvania, and settled in Fort Wayne in 1861. Soon after he arrived, he opened a wagon wheel manufacturing plant and became active in city politics. 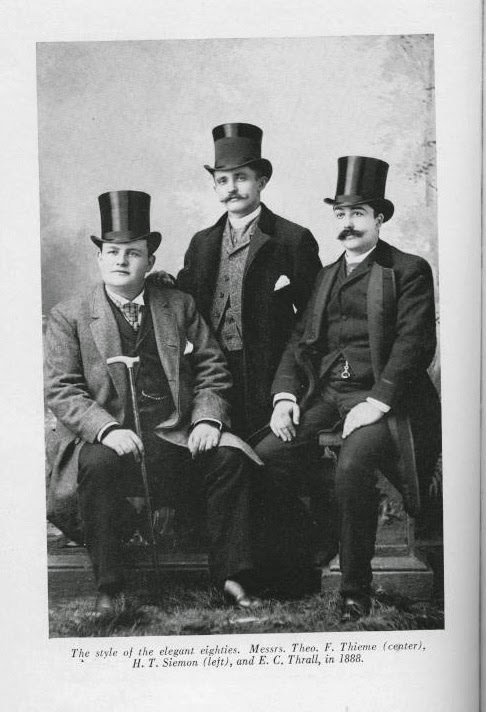 Noble’s sons, Henry and John, joined their father in the business, which expanded throughout the last decades of the nineteenth century to include the Olds Coal Yards and the Olds Storage Company. Their Olds Wagon Works was popular with farmers, freight lines, mills and lumber. The company became nationally known and in its day was among Fort Wayne’s largest employers. Henry G. Olds became one of the first officers serving as president of the Fort Wayne Jenney Electric Light Company, the predecessor of today’s General Electric Company. The home at 407 West Berry was purchased by the Mizpah Shrine in 1910.
Notable among the homes along this street is the one at 1012 West Berry once the address of Joel Roberts Ninde the woman who championed the “Home of Convenience.” (See Fort Wayne Monthly June 2006) Her Wildwood Builders Company during the early years of the nineteenth century featured designs that were pleasing to the eye yet economical, convenient, and efficient. Another beautiful Fort Wayne residence is the Queen Ann style home at 1026 West Berry built in 1898 by Theodore F. Thieme, who was a well-known Fort Wayne manufacturer during the early portion of the twentieth century. A small theatre, designed by local architects Wing and Mahurin, was added to the structure in 1922. That same year the home was donated to the Fort Wayne Art Association and served as the art school in Fort Wayne for nearly seven decades until 1991 when the Department of Fine Arts at Indiana University-Purdue University at Fort Wayne opened a new on campus facility. Theodore Thieme was a man who touched the lives of virtually everyone because of the knitting process he brought to America. He was born in Fort Wayne in 1857 to a German immigrant family that operated the Thieme Brothers clothing store. Graduating from the New York College of Pharmacy in 1876, Theodore worked for a time at the Meyer Brothers Drug Store; and later he managed his own pharmacy until 1890. Thieme had traveled to Germany where he witnessed textile manufacturing and realized the possibilities of developing an American-made line of fine hosiery. It was during this visit that he had an inspiration that resulted in a first-of-its-kind in the United States. Returning home, and with an investment of $30,000, Thieme established the Wayne Knitting Mills in 1891. At first, his full-fashioned hosiery operations were manufactured in rented spaces in a three-story building at the northeast corner of Clinton and Main streets. Thieme built his own factory in 1893 on West Main Street in what was popularly known as “the Nebraska neighborhood” because it was so far out “west” of town. There, he continued making the nationally famous “Wayne Knit Hosiery” for men and women and “Pony Stockings” for children. During the late 1800s, Theodore Thieme’s Wayne Knitting Mills provided a large dormitory as well as a clubhouse for the use of hundreds of employees. In 1923, however, Thieme sold the company to the Munsingwear Corporation of Minneapolis, Minnesota. Allen County Historian Tom Castaldi is author of the Wabash & Erie Canal Notebook series; hosts “On the Heritage Trail,” which is broadcast at 6:35 a.m., 8:35 a.m. and 6:30 p.m. Mondays on WBOI, 89.1 FM; and “Historia Nostra” heard on WLYV-1450 AM and WRRO 89.9 FM. Enjoy his previously published columns on the History Center’s blog, “Our Stories,” at history centerfw.blogspot.com.